As we mature, our hair changes along with us—a natural but often frustrating process. “The life span and capability of hair follicle stem cells decrease as we age, inhibiting the ability to regenerate the cells responsible for hair growth, texture, and pigment,” explains Jim Markham, CEO and Founder of ColorProof. Meaning: Locks that were once lush and voluminous become weak, dull, and gray; hair loss and thinning is an issue, too, that 40% of American women struggle with, accordinig to the American Academy of Dermatology. Healthy, younger-looking hair begins with what you feed it. “Eat foods that are rich in omega-3 fatty acids like salmon and mackerel—they’re great for promoting shiny hair, and shiny hair looks young and full of life,” says Angelo David ), New York City’s leading celebrity stylist for luxury wigs, extensions, and thinning hair solutions. Walnuts, lean meats, lentils, avocados, and green vegetables also contain essential vitamins and antioxidants that promote healthy strands. The right cut is key to making your hair look more youthful and full. At your next salon appointment, ask your stylist to give you “a cut that enhances your best features and doesn’t hide your face,” says Elvin Arvelo, co-owner of Oon Arvelo Salon in New York City. Adds Markham: “Medium and shorter lengths are most flattering on women with thinning hair, making it appear fuller and stronger. Avoid longer lengths, which only draw attention to problem and can make ends look scraggly.” Also, stay away from razor cuts or too many layers. If you hair took on an ashier tone as you aged, “ask your colorist to add buttery tones to create a fuller, more youthful look,” says Peter Oon, co-owner of Oon Arvelo Salon. 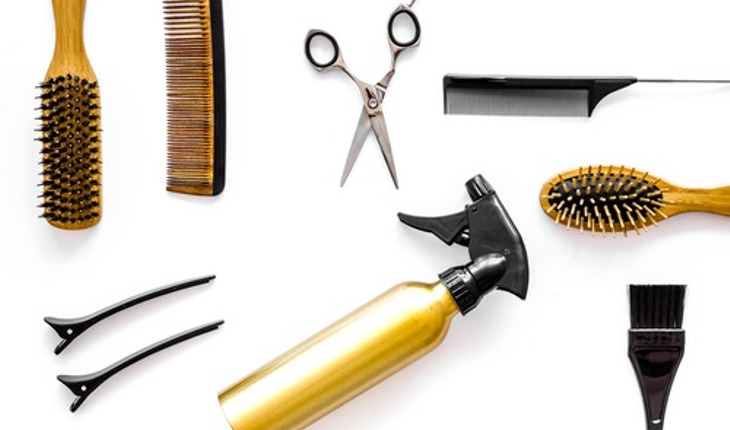 We always feel our best on a good hair day—but for most, a gorgeous hairstyle is usually thanks to our trusty blow dryers, flat irons, or curling wands. Unfortunately, excessive heat is especially detrimental to aging hair, damaging the cuticle and causing frizz, dullness, and breakage. “Use a thermal protectant before each heat-related styling step,” says Nik Martel, Creative Artist for Farouk Systems. Or even better: skip the hot tools all together and go au natural! Hair becomes more delicate as we age, so it’s extremely important to treat it with extra TLC—similar to how you handle your eye area. “We forget that the everyday hairstyles we create—like buns, braids, and ponytails—can cause wear and tear,” explains Farel. “Avoid tools and hairstyles that pull your hair, like rough brushes and tight ponytails.” And when you want to put your hair up in the summer heat, do so with hairpins or a fabric elastic without a metal clasp to avoid snagging. Also, 50% of hair breakage occurs when it’s wet; once you hop out of the shower, “use a wide tooth comb or flexible bristle detangling brush to gently work through knots, starting at the ends and working your way up,” says Markham. But remember that less is more—too much product will weigh thinning hair down.